Blades are extremely useful for filling long trenches - all you have to do is set the angle and drive from end to end. It is also handy for pushing dirt and making drains, etc. Snow is easily pushed with a Dingo and blade. The Dingo Blade is 1.2m wide and can angle and tilt just like a bulldozer. Features: Hydraulic or Manual Angle Setting. 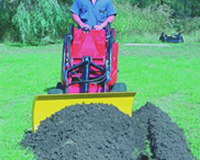 Used For: Pushing Dirt, Snow, and Debris, Back Filling Trenches, Forming Shallow Drains. Used By: Fencing Contractors, Dingo Contractors, Hire Com-panies, Landscapers, Builders, Paving Contractors, Bricklayers.